for sure, leave you in awe and wonderment. Be it spirituality, yoga, meditation, adventure sports or pilgrimage, Rishikesh is the one-stop destination to feed your wanderlust soul. This holy land witnesses travelers from around the globe all over the year which makes it one of the busiest travel destinations across India. Situated on the lap of the Himalayas, this bustling city promises to enchant and mesmerize you in ways more than one. Experience the sights, sounds and vibes of this place and gift yourself a memory that will stay with you forever. 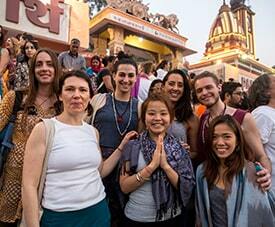 You’ll never be short of excitement and activities in Rishikesh since it has a lot to offer. From camping along the banks of the Ganges to rafting in the rapids to practicing the ancient art of ‘yoga’, you have it all. 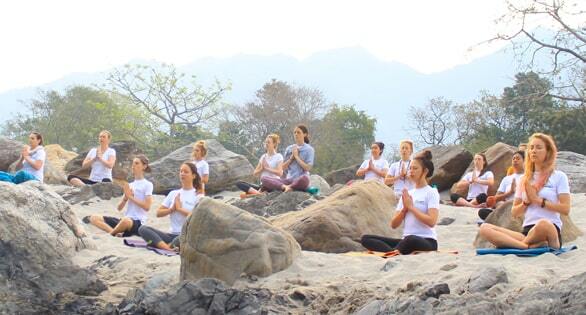 So, here is a list of the activities not to miss out on your trip to Rishikesh. Want to spend a day amidst nature and serene surroundings? Why not spend a day or two camping along the banks of the river Ganges amidst the serene and calm surroundings? You’ll surely cherish this experience as it allows you to be at one with nature. Take a dip in the Ganges, enjoy the night with a bonfire, make new friends and most importantly, do something that you’ve never done before. 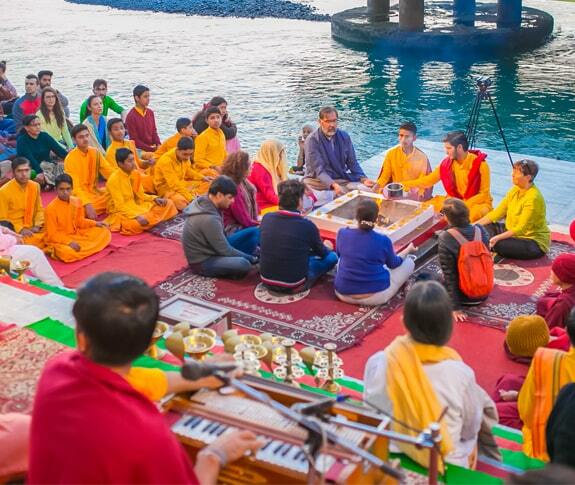 World over, Rishikesh is known as the ‘Yoga Capital’ and throngs of people from all parts of the globe visit this quaint town tucked away in the Himalayan foothills every day. 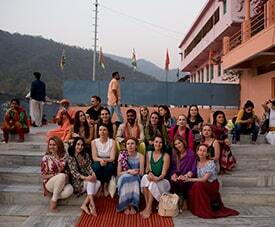 Rishikesh has served as the yoga base camp for sadhus (holy men) and ascetics traveling to the Himalayas since ages. They are the ones who started meditating in its calm and tranquil settings and made this place a preferred choice of meditation. So, once you are in Rishikesh, do not let go of the opportunity to learn this ancient form of science in the very soil it originated. You’ll find numerous yoga training centers, retreats and wellness holiday centers that not only enlighten you about the spiritual and wellness aspects of yoga but, also intersperse yoga along with spa treatments and special travel tours to rejuvenate your body and soul completely. You must have seen people in huge numbers gathering in the ghats (river bank) putting in oil lit earthen lamps that are wrapped in leaves on the Ganges? 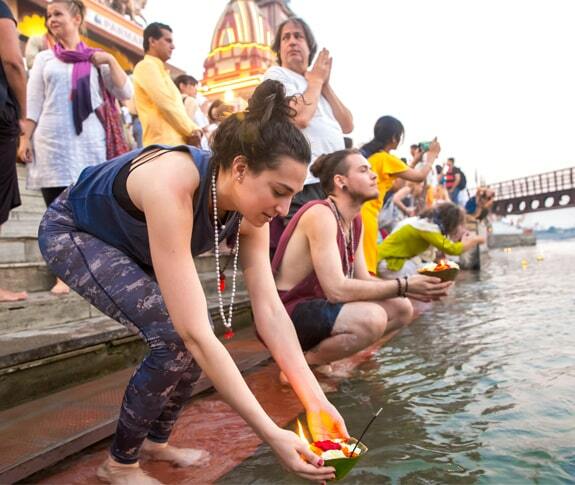 This is actually a Hindu tradition where people offer their prayers to ‘Ganga Maa’ (Goddess Ganga). 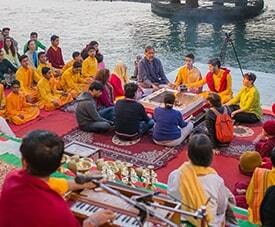 Be a part of this splendor and enjoy a night of ‘Ganga Aarti’ at dusk. This would be your moment to capture this magnificent show through your camera lenses and immerse yourself in this surreal experience. Replete with temples, Rishikesh will certainly leave you awe-inspired with their brilliant structures, carvings and paintings. From old to new, there are a plethora of temples occupying different corners of this divine land. Apart from the well-known temples like ‘Neelkanth’, ‘ParmathNiketan’, ‘TeraManzil’, visit the ‘Kunajpuri’ temple perched on top of a hill offering a 360-degree view of the natural surroundings. Though Rishikesh has the reputation of being the ‘Spiritual capital of India’ but, this is also a place where adrenaline junkies certainly find their fare of shares of excitement and thrill. Staring from white water rafting to bungee jumping to rappelling to rock climbing and more, you will be amazed to see the wide array of adventure activities present here. Also, there are plenty of trekking options available from Rishikesh as well, which can take you to the heart of the Himalayas amid peaceful and serene surroundings. Similar to various other holy destinations in India, Rishikesh is full of shops selling different items ranging from religious paraphernalia to clothing to antiques, etc. Head off to the bustling markets and bazaars full of colorful shops selling different items and take back souvenirs for your near and dear ones back home. Shopping here is not only about buying things but experiencing something that is unique in itself. You’ll find all sorts of items that you can think of once you hit the cozy, narrow lanes of Rishikesh. You do need to bargain with the shopkeepers at times and that is the best part about shopping in Rishikesh. It will be fun and full of excitement, that’s for sure! Ashrams are also available in plenty close to the famous ‘Swarg Ashram’. Ashrams like ‘Nirmal Ashram’, ‘SantSeva Ashram’ and ‘Sri Ved Niketan Ashram’ offer clean rooms along with basic amenities at extremely affordable prices. If you are looking for more expensive places of accommodation to enjoy exquisiteness with a touch of luxury, you’ll love to explore the accommodation choices at ‘The Ganga Beach Resort’ and ‘Hotel Ganga Kinare’. There are plenty of cafes in Rishikesh where you can enjoy some majestic views of the surroundings by sipping on a juice, coffee, ayurvedic tea or even some ‘lassi’. Cafes such as ‘Freedom Ganga Café’, ‘Madras Café’, ‘Ramana’s Organic Café’,’60’s Café’ and Café Karma are widely popular among who wish to relax, chill out and enjoy a cuppa of a latte. Alcoholic beverages are not available in Rishikesh, however, finer accommodations like ‘The Palms Midway Resorts’ and Road House Bistro’ do have their own restaurant and bars where you can get beers. 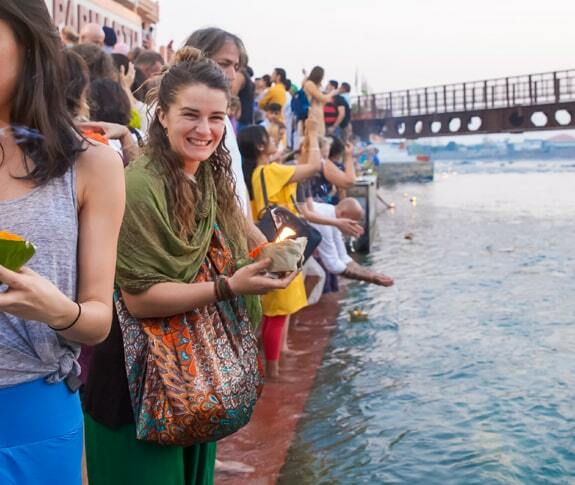 Rishikesh can be visited all year round but the ideal time to visit it is from October to March. Winters are usually not that cold in Rishikesh and the temperature usually lies around 8°C (46.4°F) at night to 20°C (68°F) during the daytime. Winters are usually the time when the city witnesses maximum footfall. Monsoon is the best time for nature lovers to experience the refreshing green landscape, though the season is marked by heavy rainfall at times. Summers in Rishikesh are humid and hot and it wouldn’t be a surprise if the mercury touches the 39°C to 40°C (102°F to 104°F). But, then again, this is also the time when the ‘International Yoga Festival’ is held and people from all over the gather here to be a part of it. Summers are also the time when you can have the best rafting experience. By Air : Rishikesh does not have any airports. The nearest airport is ‘Jolly Grant Airport’ located in Dehradun which is just 35kms away. Regular flights are available from Dehradun to important cities like ‘Delhi’, ‘Amritsar’, ‘Chandigarh’, etc. By Train : If you are traveling on a train then, it is always recommended to book your tickets till Haridwar since Rishikesh is not that well-connected with other major stations. Trains are available from major cities like New Delhi, Jaipur, Amritsar, etc. to Haridwar on a daily basis and fares are also cheap. 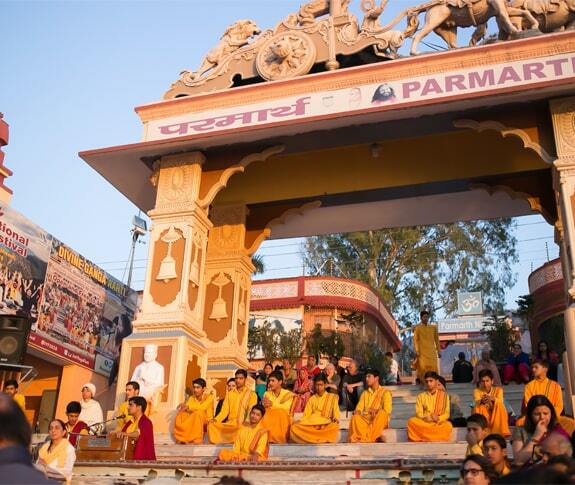 Once you alight from the train at Haridwar, you can either book a cab or even hire an autorickshaw that will take you to Rishikesh in about 40 minutes. By Road : Rishikesh is well-connected by road to important and well-known destinations like Haridwar, Dehradun and New Delhi. If you are coming from New Delhi, there are plenty of luxury buses that ply from New Delhi to Dehradun on a daily basis. If you board the bus at night, you will reach Dehradun in the early morning and from there you can either hire a cab or book a shared cab as well. The journey from New Delhi to Dehradun takes about 6 hours. Though Rishikesh attracts a lot of international travelers from all over the globe and the government is very particular regarding their safety and security but, it is always a good idea to be cautious and attentive if you are in a stranger land. 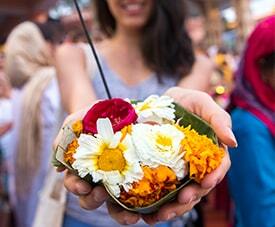 Rishikesh is considered a holy place in India. So, you should dress modestly and avoid unwanted attention from the locals. During an emergency, do not hesitate to take help from the local authorities or the police. Note down emergency numbers from the authorities before you travel so that whenever there is an emergency, you can quickly contact them and get the necessary assistance. Though most of the times you will get help from the locals but not all people are the same. Always remain alert and walk with an air of confidence which shows that you already know a lot about the city and how everything works over here.